Thanks to a series of troughs passing through the state, May 2015 goes down as one of the coolest & wettest we’ve seen in recent memory. 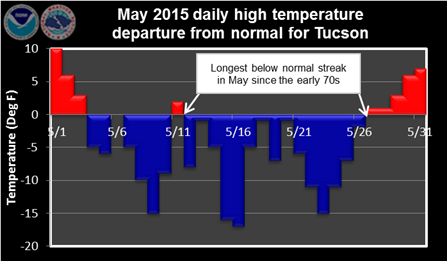 With an average temperature of 73.4°, Tucson registered the 56th coolest May on record. 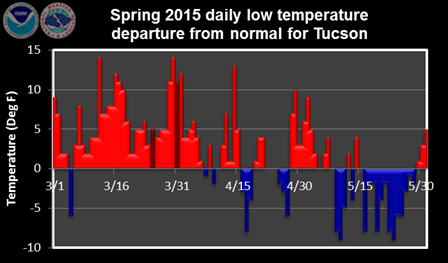 Interesting to note that Tucson had a 15 day streak of below average highs, the longest such stretch since 1977. While 0.09″ rain fell at Tucson International Airport last month, many Metro Tucson locations saw at least 0.25″. Casa de Beamish in Oro Valley picked up a whopping 0.62″ rain last month. That’s easily the most I’ve recorded during the month of May, dating back to 2011. Below is the full climate report compiled by the National Weather Service forecast office in Tucson. Longest stretch of below normal highs for May since early 1970s. The low temperatures also had an extended stretch of being below normal. The 13 days, starting on 16th and continuing through the 28th, was the longest in May since the early 1970s (see table below) and the longest since 18 days were recorded from late 2010 (December 30th) to early 2011 (January 16th). Longest stretch of below normal lows for May since early 1970s. High pressure aloft built over the area as the month closed which ended the below normal high and low temperature streaks. The heat was then turned on with Tucson making its first run at triple digit highs for 2015 on the 30th with the ice breaking at 2:03 PM. 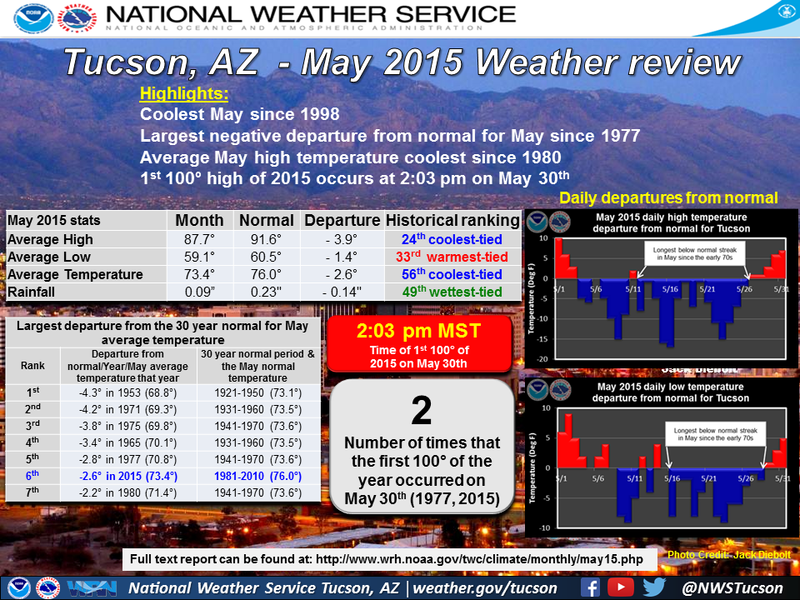 The historical (1895-2014) first 100° date is May 26th. Rainfall across the metro area, using several sources like rainlog.org and the Pima County Regional Flood Control District gages, varied widely from 0.05″ to 1″, with the highest amounts on the north and northwest side of the metro area. The International airport, which is the official recording location for Tucson, recorded just under a tenth of an inch /0.09″/ of rain. Funny to say that the 0.09″ ranks as the 49th wettest May on record, tied with 1895 & 1928. The last May that was above normal at the airport was in 2009 (0.67″). When did daily high/lows occur? A most enjoyable May countered the warmer than normal March (2nd warmest) and April (18th warmest) to produce the 13th warmest Spring on record with an average Spring temperature of 69.6°. However this is the second straight spring that was cooler than the previous spring (2013 – 71.5°; 2014 – 70.3°). 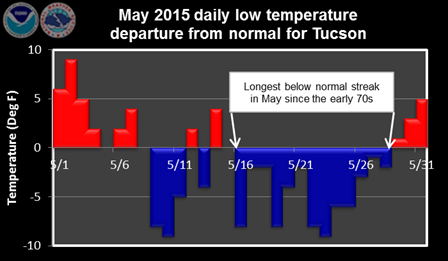 Temperature extremes ranged from 104° on May 31st to a low of 39° on March 5th. Precipitation amounts across the metro area for the spring season, using several sources like rainlog.org, thePima County Regional Flood Control District gages and CoCoRaHS, varied widely and mostly ranged from 0.30″ to 2″ with the highest totals on the north and northwest sides of the metro area. Officially, the airport recorded 0.75″ which is around a half an inch below normal and ranks as the 52nd driest Spring on record. This is also the 10th straight Spring with below normal rainfall at the International airport. Additionally when you look at the 10 year running averages, Spring’s 2006 to 2015 averaged only 0.59″. This is the lowest 10 year average for Spring on record. This is a dramatic drop from nearly 20 years ago when Spring’s 1986 to 1995 had a 10 year average of 1.55″. That equates to a 62% decrease. The first five months of 2015 goes into the record books as the 2nd WARMEST on record with an average yearly temperature to date of 65.3° which is 2.9° above normal. Rainfall is above normal for the first time through the end of May since 2010 with 3.70″ being recorded at the International airport. This ranks the 26th wettest January thru May period on record, tied with 1995. Today – Hot and breezy. 102°, west wind 10-20 MPH. Tonight – Clear and mild. 68°, southeast wind 5-10 MPH. Tomorrow – Sunny and hot. 100°, west wind 10-15 MPH. Brace yourself for another hot and breezy afternoon in the desert. 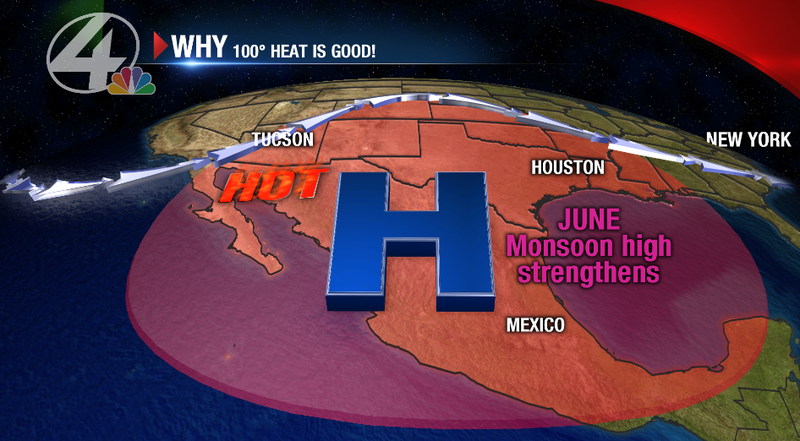 High pressure over Sonora drives daytime highs into the 100s for the 4th time this year. 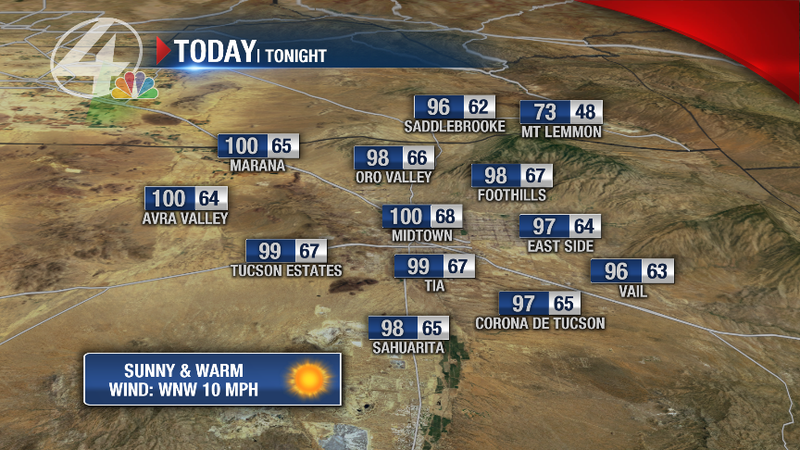 Metro Tucson reaches the 101-103° range today under sunny skies. Gusty west winds up to 20 MPH are possible, weakening after sunset. Wednesday features plenty of sunshine and highs at or near the century mark. An unsettled pattern may evolve heading into the weekend. 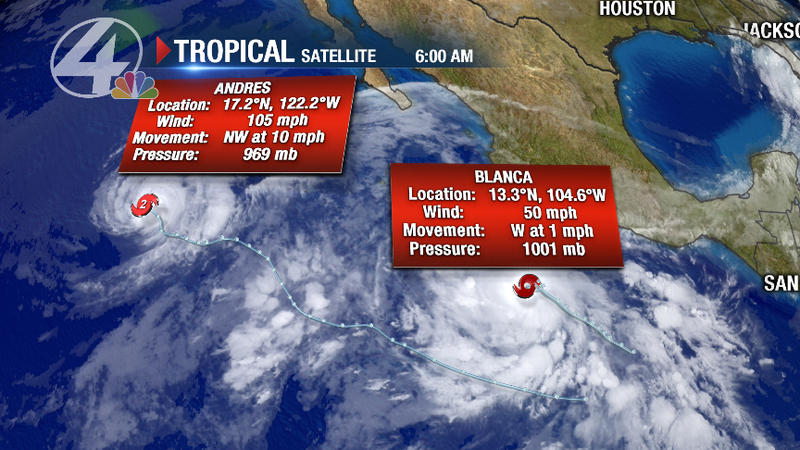 Models hint at a trough tapping into moisture from Hurricane Andres and Tropical Storm Blanca. This may lead to isolated storms Friday into early next week. Best chance of storms looks to be Sunday and Monday, with a 20% chance each day. It should be noted that there is considerable model differences in storm chances. The American GFS model shows widespread storm activity, while the European model depicts a slightly drier atmosphere. If you have outdoor plans this weekend, stay tuned to the latest forecast as it is subject to change. It sounds crazy, but there is a silver lining to the sweltering temps we’ll endure this month. Allow me to explain. The reason June’s the hottest month of the year is due to the large, unforgiving dome of high pressure that generally develops in Mexico. 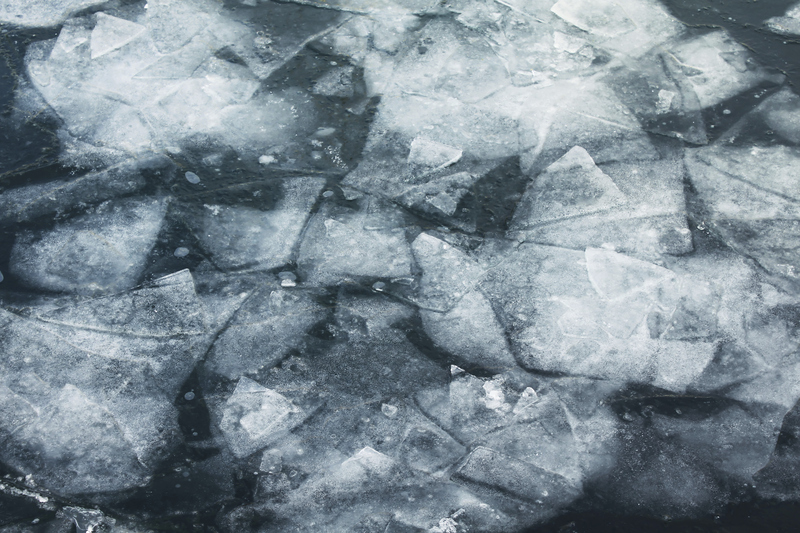 High pressure is Mother Nature’s vice grip – it squeezes the atmosphere, compressing air molecules. These air molecules bounce off one another rapidly, creating friction, heat and many triple digit days. What good comes out of this? Fast forward to July. That same high pressure center heads north and usually parks near the Four Corners. Air flow around high pressure is clockwise, so winds aloft shift from southwest in June to southeast a month later. Moisture typically trapped in the Gulf of Mexico and mainland Mexico is allowed to surge into Arizona, thus bringing the onset of the Monsoon. Long story short: the Monsoon high is developing. Be patient. Stay cool! The payoff arrives around the 4th of July. Today – Hot & breezy. 104°, west wind 10-20 MPH. Tonight – Clear & mild. 71°, southeast wind 5-10 MPH. Tomorrow – Sunny & hot. 102°, west wind 10-15 MPH. After one of the coolest May’s in recent memory, Mother Nature brings the sizzle to start June. High pressure parks east of Arizona this afternoon. Daytime highs reach the 102-104° range in Metro Tucson, running 6-8° above average. Expect gusty west winds up to 20 MPH today, which should weaken after sunset this evening. Triple digit heat sticks around through at least Thursday with ample sunshine. 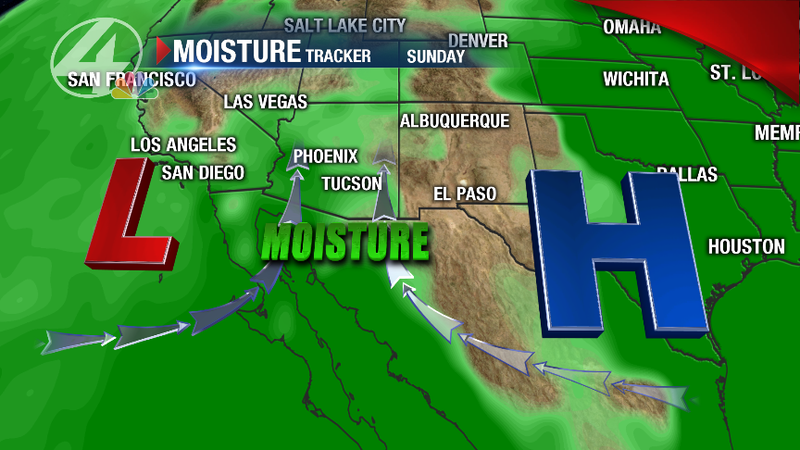 A low pressure trough may funnel tropical moisture in from the eastern Pacific heading into the weekend. There is a 10% chance of storms Friday through Sunday as highs drop to the upper 90s. Best chance of storms will likely be into the higher elevations. 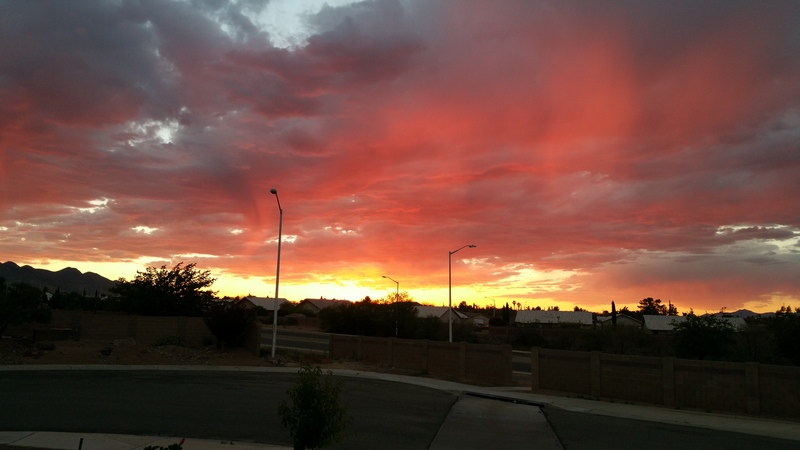 Virga dancing at sundown, snapped last night by David Lippincott in Sierra Vista. 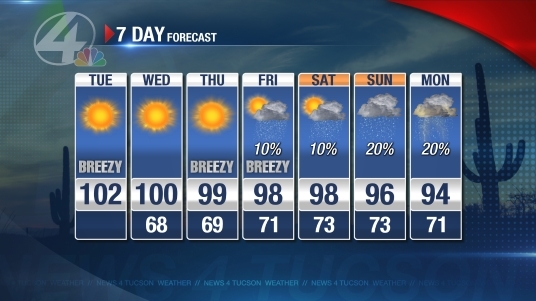 Consider this a “Monsoon tease” as we wait for our rainy season to arrive in a month. 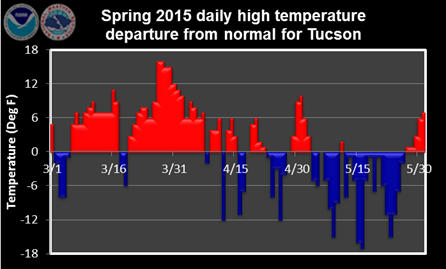 Tucson has registered a triple digit temperature for the first time in 2015. At 2:03 PM today, the thermometer at Tucson International Airport hit 100°. This comes a few days after the average “Ice Break” date of May 26th. A little late, but certainly not out of the ordinary. Buckle up. We’ve got roughly 61 more of these hot days to go this year. 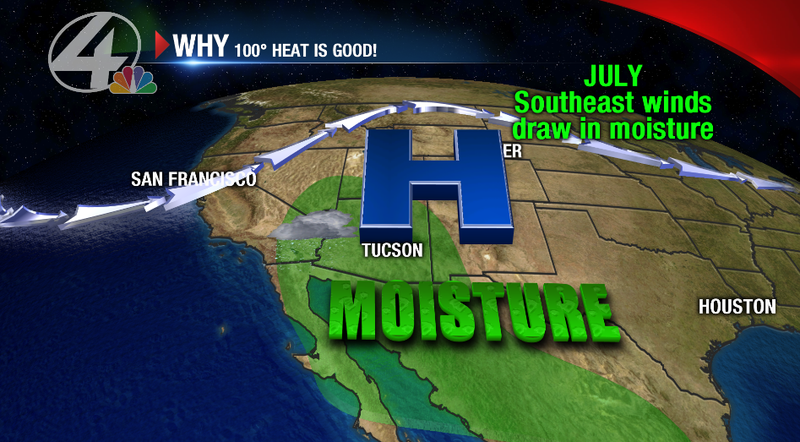 Click here for all you ever wanted to know about triple digit heat in the Old Pueblo. So who won the News 4 Tucson Ice Break contest? Meteorologist John Patrick has the answer tonight at 10! Friday’s Tucson Forecast: Ice Break cometh! Today – Sunny, very warm. 99°, west-northwest wind 10 MPH. Tonight – Clear. 67°, southeast wind 5 MPH. Tomorrow – Hot! 101°, west wind 10 MPH. High pressure builds over the state the next several days. While backyard thermometers across Metro Tucson reach triple digits today, the airport likely tops out in the upper 90s with sunny skies. Expect the 1st triple digit day of 2015 to arrive Saturday afternoon. This would be a few days later than the average date for the first 100° day, which historically sits around May 26th. Triple digit heat sticks around through the middle of next week as high pressure slowly loosens its grip on the state. 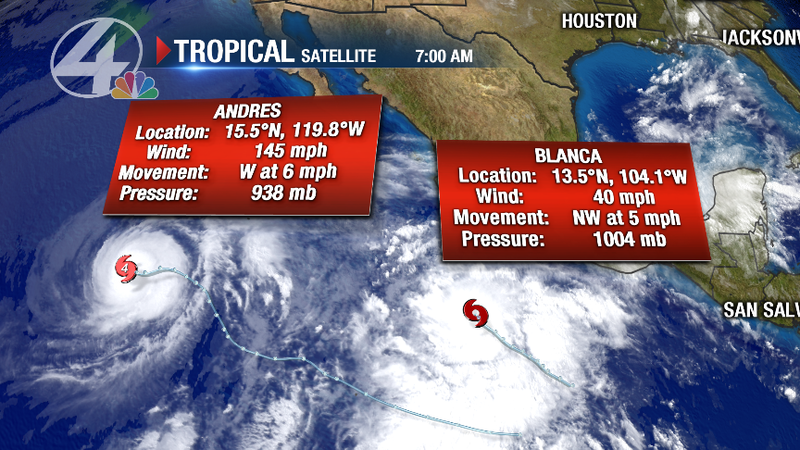 Off the Mexico coast, Tropical Storm Andres is slated to become a hurricane later today. Latest computer model data shows Andres staying away from land, with moisture confined to areas well south of Arizona late next week. How many ways can you say “it’s hot”? 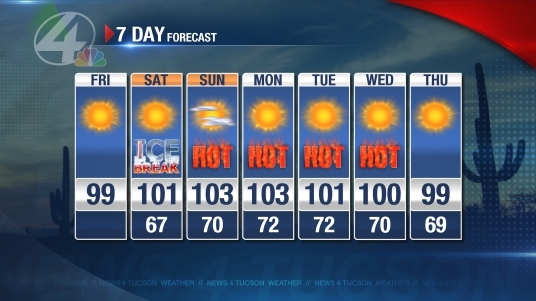 Tucson Today rule #1: you can’t say it’s “hot” until the temperature reaches at least 100°. But why call it “hot” when there’s other original, G-rated words to describe it? 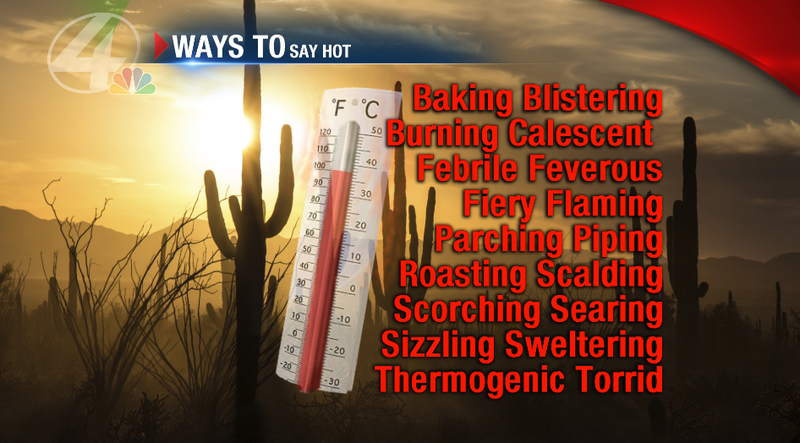 Expand your weather vocabulary by adding a few of these into your daily musings on our triple digit heat! Bonus points if you can expand on this list in the comments section below. Stay cool, hearty desert dwellers.